Mother Nature brought an early start to the 2018-19 season which means it's time to start planning your Vermont winter getaway. In the spirit of the holiday season, these ski areas have gift-wrapped some amazing packages just for you! 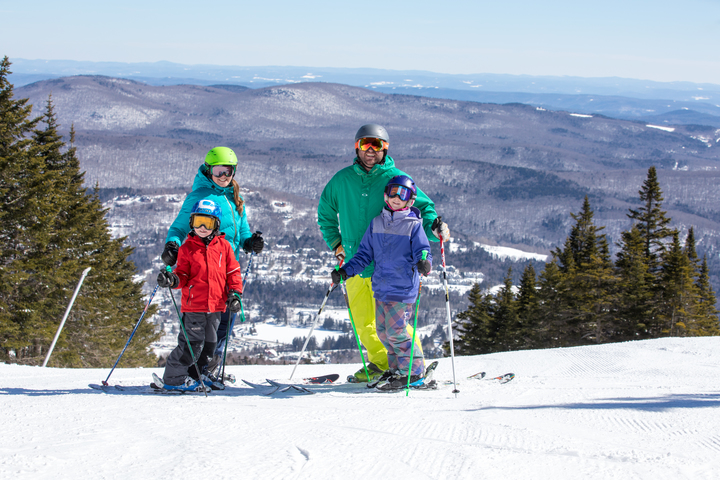 Check out all the deals that these Vermont resorts have put together and book a trip that will make your family and your wallet smile. $30 Thursdays at Mt. Ellen: Thursdays, non-holiday through March 28, 2019. Head to Mt. Ellen on non-holiday Thursdays for $30 Mt. Ellen lift tickets, and an après party with live music, Cabot cheese, and drink specials from Citizen Cider and Zero Gravity. Holiday dates: 2/21/19. Save up to 40% with Ski & Stay Packages: Bundle lift tickets with lodging and save. Available at Clay Brook Hotel & Residences, Sugarbush Inn and Resort Condominiums. Save up to 50% with Online Tickets: Save up to 50% on All Mountain lift tickets when you purchase more than 48 hours in advance, and save 10% online the day of your visit. Ikon Passholder Lodging Specials: 2018-19 Ikon and Ikon Base passholders receive 30% off midweek lodging and 20% off weekend stays. Valid at Clay Brook, Resort Condominiums, and Sugarbush Inn. Two night minimum stay required. Not valid during Holiday periods. Some restrictions apply. To book, call 800-53-SUGAR. Mountain Collective Lodging Specials: 2018-19 Mountain Collective passholders save 20% on non-holiday lodging at Clay Brook Hotel and Residences, Sugarbush Inn and resort condominiums. Some restrictions apply. To book, call 800-53-SUGAR. Sun Mountain Card: The Sun Mountain Card saves you up to $30 off every full day lift ticket for the 2018-19 season, PLUS you get a FREE non-holiday Lift Ticket once you purchase the card. The card literally pays for itself after just one visit. Discounts good on all-day lift tickets only, non-transferable. Purchase the Sun Mountain Card before December 14, 2018 and save an additional $10! KidsRule 6-Pack & Pass: Get six KidsRule lessons and a Full Junior Season Pass for just $975! The KidsRule Mountain Camps, for kids ages 5-12, is our premier all-day program for skiers and snowboarders of all ability levels. A 2018-19 Junior Full Season Pass is $750. An all-day KidsRule Mountain Camps lesson is $180, so six lessons at retail is $180 x 6 = $1080. You’re getting $1830 worth of product for $975, plus your child is out on the slopes, learning AND having the time of their life. Win. Purchase Early Online: Buy early and take advantage of the very best prices on lift tickets when you pre-purchase at www.bromley.com. Select the dates you'll be visiting Bromley Mountain and choose from single or multi-day tickets to access deep discounts. Keep in mind, the earlier you book the better – online ticket rates increase daily as your visit gets closer! Online purchases must be made at least one day in advance of your visit. Bromley Beginner Packages: Bromley's skiing/snowboarding packages include everything a first-time skier or snowboarder needs to get started - equipment (boots, skis & poles/snowboard & helmet), 1 hour 45 minute lesson in a special Learning Zone, and limited lift ticket for easy-to-ride lifts (Star Carpet in the Learning Zone & the East Meadow Chairlift). Reservations are strongly recommended. Classes are divided into Get 1, 2 & 3 - advancing as you progress! Ski & Stay Getaway: At just $79 per person, per night, Mount Snow's Ski & Stay Getaway package includes lodging at Snow Lake Lodge, continental breakfast & selected lift ticket. Founder's Day Weekend Package: Mount Snow turns 64 this year! Help us celebrate with this weekend package and get a sweet lift ticket deal for our birthday. For just $176 for 2 nights/3 days, this package offers $12 lift tickets on Friday, December 14, 2018. Saint Patrick's Weekend Package: Join us as we celebrate the Irish Saint. For just $249 for 2 nights/3 days, this package includes a $17 lift ticket on Friday, March 15th. Friday activities include skiing in costume, live music on Cuzzins' deck, Green Eggs & Kegs in the morning, and more. The Freedom 4-Pack gives you four unrestricted, single-ticket vouchers that provde the freedom and flexibility to ski Magic any four days during the 2018-19 season. These vouchers are a great gift idea for friends and family this holiday season. The Freedom 4-Pack must be purchased by November 30th. Only $209 + tax and free shipping, saving 25% off ticket prices. The Magic Throwback Card gets you $29 tickets all season long with no blackout dates! The Throwback Card is only $149 - save $10 by purchasing before November 30th for ticket prices that will throw you back to the 1980s! Northeast Kingdom Sundays: At Burke Mountain every Sunday is NEK Sunday. $28 Half-day afternoon tickets on Sundays (non-holiday) are now available to everyone! Tickets go on sale day-of at 12:15pm and can be used at the lift line starting at 12:30pm. This deal is available every Sunday (non-holday) through the 2018-19 season. Silver Streaker Tuesday and Thursday at Burke Mountain. On Tuesdays & Thursdays (non-holiday) full-day lift tickets are just $35.00 for skiers and riders age 55 and older. ID may be required for those with a youthful appearance. Wicked Wednesdays: Purchase 1 full-day lift ticket at $73.00 and receive two same-day tickets FREE! Party of three must be present to receive ticket deal (non-holiday). Online Savings: The best way to save on lift ticket is to purchase them online in advance. Mad River Glen utilizes a flat rate window ticket rate that remains constant every day of the season. On-line tickets enable skiers to save considerably especially when you plan to visit during slower periods or by purchasing further in advance. Visit https://www.madriverglen.com/lift-tickets-passes/ to save on lift tickets. Holiday Getaway: Make the most of winter with two nights of lodging and three days of skiing or riding this December. Join us on Stratton Mountain and save up to 50 percent off stays in select lodging when you arrive between December 2, 2018 and December 25, 2018. Lift & Lodging: Stratton Mountain is the place to be with 99 trails, a top rated après scene and snow so great, it’s guaranteed. Ski and stay two to four days and save up to 40 percent at Select Stratton Mountain properties, including daily lift tickets and access to the Stratton Fitness and Training Center. Midweek: Snowstorm headed to the Green Mountains midweek? Stay two to four nights and save up to 40 percent in select Stratton lodging properties. Savings are available Sunday through Thursday nights, and into March. The Long Weekend: Treat yourself to a long weekend on the slopes with family and friends. Make the mountain yours when you stay Friday and Saturday nights and get Thursday or Sunday night at 60 percent off. College Break: Take a break from the books and bring your friends to shred 99 trails, glades, and top-rated terrain parks. Book a one, two or three night stay starting at $75 per person, per day. Available midweek nights from December 9 to 20, January 1 to 17, and March 3 to 21. Flex Card: Your pass to season long savings. For $269, get three any day visits with no blackouts. When you visit a fourth time, pay $89, and with your fifth visit free you’ll never pay more than $89 for any additional days. New to skiing and riding or know someone looking to learn?